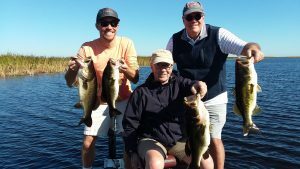 Dennis Carrier and his son from Maine came fishing with Okeechobee Fishing Guides/Okeechobee Bass Fishing and what an awesome day we had! 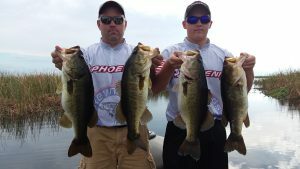 We caught 37 Big O bass in a hours on live wild shiners. These guys came from freezing lakes and temps. 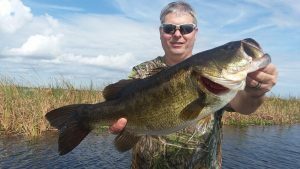 to sunny, warm Florida to catch these GIANT bass. The weather has been perfect and the BIG bass are moving in. These guys fish lots of tournaments in Maine but they never catch bass like this! These too are great fishermen and women. 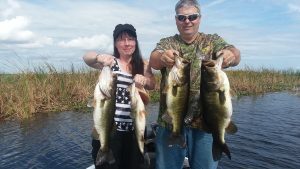 They caught 45 bass in ONLY 5 hrs with 6 fish over 5 lbs. 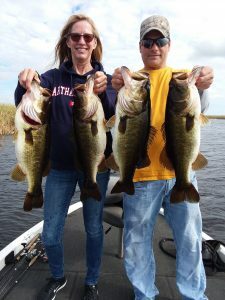 Jinah catching her personal best with Okeechobee Fishing Guides being 5lbs 13oz. They are coming back again Monday for round 2! The fish are really eating right now and should only continue to get better and better as we plunge into our Fall/Winter season. These 2 are loving this Florida weather and are happy to be out of Boston during the BIG storm headed their way. This is Jackson and his Dad Bryan, and his grandfather Mac. They had an AWESOME day on Lake O while the wives were out shopping. 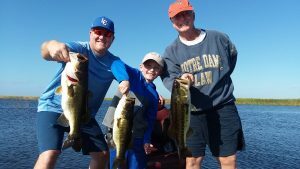 Jackson loved catching all these big O bass and his father and grandfather loved watching him wack one after another as well. They have vowed to make this a yearly thing after Thanksgiving and I can’t wait to take them. Thanks for coming guys and good luck during baseball season this year Jackson! Today I have the privilege of fishing with Steve and his wife Cindi from Missouri. The weather was perfect and the fishing was awesome! We caught over 30 fish in a 6hr trip on live wild shiners. 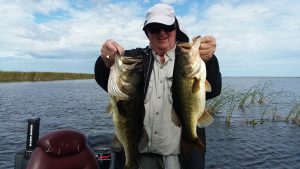 They drove all the way down to fish the awesome lake and to catch some Okeechobee Largemouth with Okeechobee Fishing Guides and Shellen Guide Service. The fishing is getting better and better each day and I am beginning to get excited for the upcoming Fall Season. If you haven’t booked your trip NOW is the time. Steve caught this 6lb 8oz bucket lips to add to his collection of monsters on the wall! Jim Leary and his brother Rob from Mass. enjoyed a wet and rainy day on Lake O. The rain didn’t stop the bite we still caught 25 or so nice fish and the sun came out toward the end of the day and dried us out. The fishing has been great and these cool mornings have been awesome. 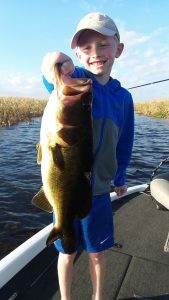 Come on out and catch that dream fish, ol’ bucket lips with Okeechobee Guide Service.